Saudi Arabia is the key region in GCC diesel genset rental market. Infrastructure expansion, establishment of manufacturing industries, increasing construction activities had led to the growth of diesel genset rental market until 2014. However, due to low oil revenues resulting into decline in construction activities, rental business has been badly affected and has declined by more than 60% since 2014. According to 6Wresearch, Saudi Arabia diesel genset rental market is projected to grow at a CAGR of 3.7% during 2017-22. The market is anticipated to witness growth in future majorly due to Saudi Government economic transformation plans to reduce their dependency on crude oil and rising demand for power. Amongst all applications, power utilities, oil & gas and construction applications dominated the market, where major growth is exhibited in manufacturing application during the forecast period. Construction sector is also anticipated to witness growth post 2018 with the recovery in crude oil prices. The report thoroughly covers the market by KVA ratings, applications and regions. The report provides the unbiased and detailed analysis of the on-going trends, opportunities/high growth areas, market drivers which would help the stakeholders to device and align their market strategies according to the current and future market dynamics. • Historical Data of Saudi Arabia Diesel Genset Rental Market Revenues for the Period 2012-2016. • Market Size & Forecast of Saudi Arabia Diesel Genset Rental Market Revenues until 2022. • Historical Data of Saudi Arabia Diesel Genset Rental Market by KVA Ratings for the Period 2012-2016. • Market Size & Forecast of Saudi Arabia Diesel Genset Rental Market Revenues by KVA Ratings until 2022. • Historical Data of Saudi Arabia Diesel Genset Rental Market Revenues by Applications for the Period 2012-2016. • Market Size & Forecast of Saudi Arabia Diesel Genset Rental Market Revenues by Applications until 2022. • Historical Data of Saudi Arabia Diesel Genset Rental Market Revenues by Regions for the Period 2012-2016. 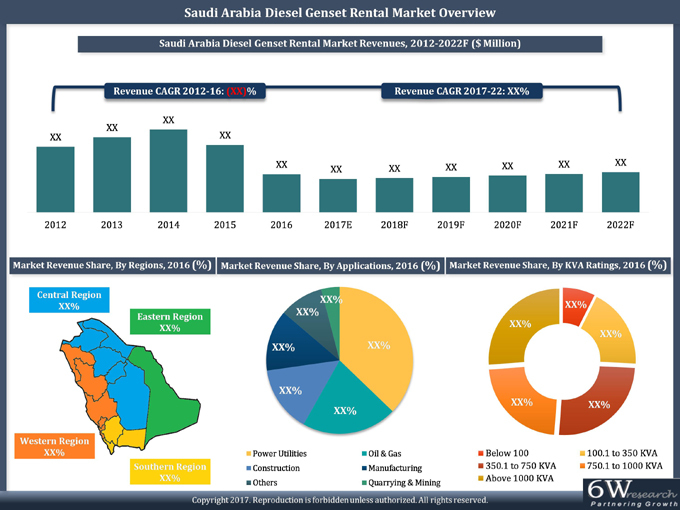 • Market Size & Forecast of Saudi Arabia Diesel Genset Rental Market Revenues by Regions until 2022. 12.1	Aggreko Middle East Ltd.
12.2	Altaaqa Alternative Solutions Co. Ltd.
12.3	Byrne Investments Saudi Arabia Ltd.
12.4	Cummins Olayan Energy, Ltd.
12.5	Energia Al Faris Contracting Company Ltd.
12.6	Energy Equipment Rental Co. Ltd.
12.7	Hertz Dayim Equipment Rental Ltd.